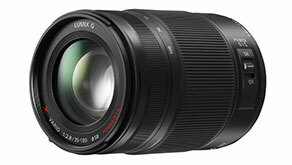 17th September, 2012� Panasonic has today launched a new addition to its LUMIX G Digital Single Lens Mirrorless (DSLM) range, the H-HS35100 - an X series 35-100mm F2.8 compact zoom lens. Designed for compatibility with the Micro Four Thirds System, the elegant metal body means the LUMIX G X 35-100mm lens is bright and precise delivering outstanding quality. Ready for adventure, the LUMIX G X 35-100mm lens is weather sealed � dustproof and splashproof � so you can always capture the action in a dusty desert or sailing the Seven Seas. With a maximum aperture of F2.8 available throughout the entire zoom range, the LUMIX G X 35-100mm lens will provide exceptional detail even in low light situations. Beautifully warm shots are possible with the exceptionally shallow depth of field, giving you incredible creative control over background blur � perfect for portrait photography. Giving photographers and videographers a powerful and versatile tool, the LUMIX G X 35-100mm perfectly complements the LUMIX G X 12-35mm lens so your kit bag is ready for any scenario. Continuing to deliver the outstanding high-quality of the LUMIX G series, the LUMIX G X 35-100mm and LUMIX G 12-35mm lens are the ideal fit for the new LUMIX GH3 � premium quality, weather sealed and ready for action. The lens incorporates Panasonic's Power O.I.S. optical image stabiliser, which makes it easy to shoot extremely clear photos even in low-light situations - especially at high zoom - by suppressing the blur caused by handshake. For stunning clarity, the LUMIX G X 35-100mm lens is treated with Panasonic's Nano Surface Coating technology, minimising reflection across the entire visual light range (380nm-780nm) by applying the extra-low refractive index coating with nano-sized structures on the surface of the lens.. This significantly reduces the amount of ghosting and lens flare. The LUMIX G X 35-100mm F2.8 is the latest addition to Panasonic's LUMIX G microsystem, which includes the world's largest range of Micro Four Thirds lenses and accessories, making sure you have the right set-up to capture every moment. For more information on Panasonic, its brand and commitment to sustainability, visit the company's website at panasonic.net/.